Each large and surprisingly varied stage is treated almost as a game in its own right, with the player sent in carrying three lives and two continues with crashing and burning only returning the player to the menu for another try, but for the more oldschool players there's also the unlockable Gauntlet mode where all five stages are strung together and attacked in turn with just two continues and to complete the bundle. The shop also has five challenge packs which use parts of the stages to throw everything apart from the kitchen sink at the player, challenging them to beat a target score or simply survive for what initially appears to be a paltry time limit; and each set must be completed to the game's satisfaction before the next can be purchased. Walter can pick his conveyance from a selection of four, although again not all of them are available without a bit of playing and ducats handed over in the shop; there are no power-ups to grab (although the guns are beefed up a little in Vaunt mode) but depending on the craft selected, the second fire button either activates a second weapon or directs the firing. Each flying machine has it's strengths and weaknesses and for some the initial ship with it's spread fire and huge beam weapon may prove to be the most comfortable to work with. 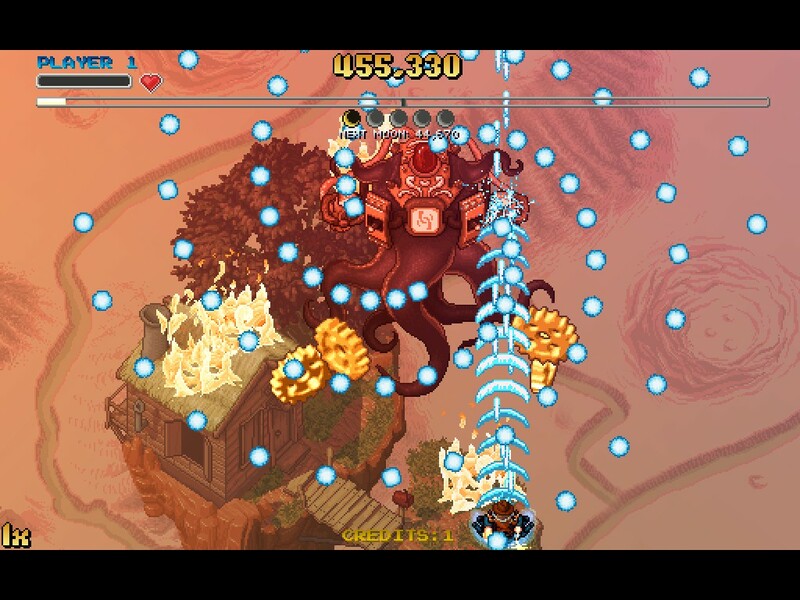 Jamestown's scoring system is, like all good bullet hell games, quite involved. 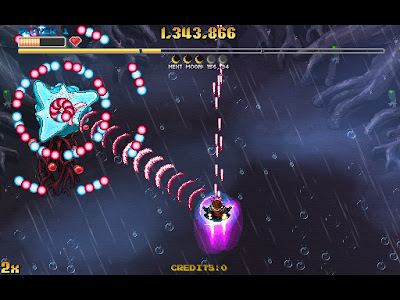 Any blasted enemy explodes in a shower of brass parts which can be collected to charge the Vaunt meter and, when that reaches maximum, the Vaunt mode itself can be activated; along with a short bullet-cancelling field when it first starts, Vaunt beefs up the scoring and the longer a player continues to feed it nuts and cogs to top the now decreasing meter up, the bigger the score bonus dished out when the Vaunt finally goes offline again. Some trial and error is required to figure out when the special time to shoot an enemy is, but if that sweet spot can be hit there'll be a larger than usual cascade of loosened components and more points to be had so its worth finding. 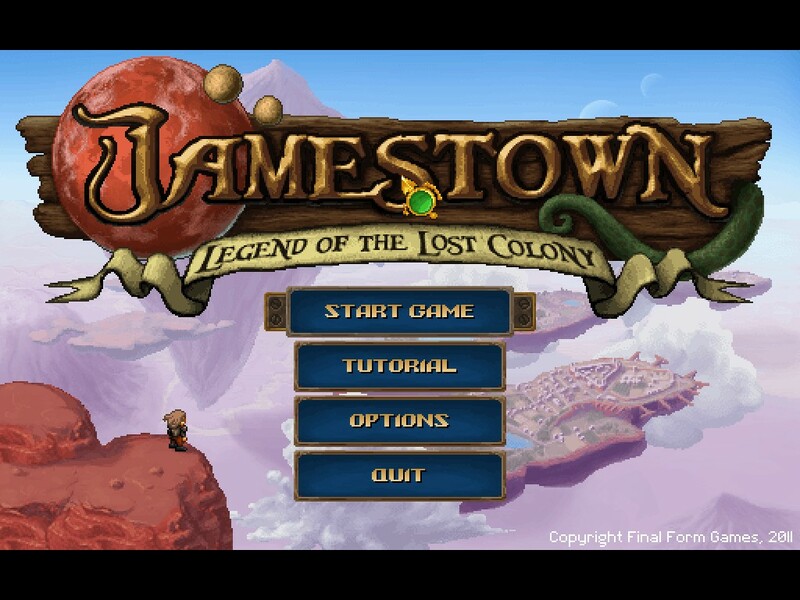 The developers Final Form spent two years working on Jamestown and their effort shows; the presentation is very solid indeed, loading and intermission screens stay in character throughout and there are cute little touches such as the soldiers on the first stage who help Raleigh out by shooting down some of the enemies! The back story is different enough that it's worth at least one read (two in fact, since the unlockable Farce mode rewrites the plot to make poor Wally seem rather dim-witted) and, although cut scenes aren't popular amongst shoot 'em up fans, the developers have thoughtfully offered ways to skip them. There's something for casual players to pick at when they have the time and a challenge for the more committed fans of the genre to get their teeth into, all wrapped in a nicely constructed bundle. Buy the game here (from the Steam page). Visit the developer's website here (Final Form).